This Open House Banner for Realtors is an Ideal Marketing Tool! Advertising Pennants are Priced to Sell on This Site! Each Open House Banner is Red, White and Blue! 100% Nylon fabric is great for outdoor use. Bold black message for attracting potential customers. Marketing flag features (2) brass grommets for attaching to a flagpole [not included]. This open house banner is ideal for use outside a new apartment complex. These message flags are made with a material that is fast drying for inclement weather. Each open house banner that is strong can withstand various elements. 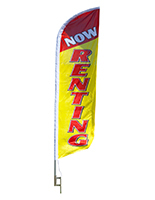 These real estate flags are wrinkle resistant, shrink resistant, and stretch resistant. 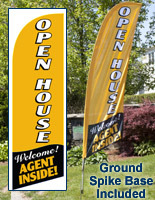 This advertising pennant is an open house banner for a flagpole [sold separately]. These flags are quick and easy to display with the use of brass grommets. 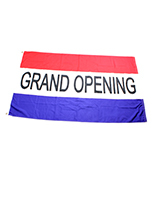 Each pennant is an open house banner that has (2) grommets located on a canvas sheet along the side of the flag. The piece of canvas is placed over the nylon to protect the fabric from becoming torn overtime where the eyelets are. This open house banner has the text reversed on one side since the message is screen printed on. The text on these real estate pennants is permanent. 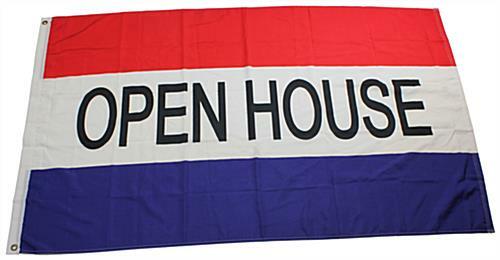 This screen printed open house banner, called a message flag, has black bold lettering with the red, white and blue striped background. The patriotic colors of the pennant are common for business displays. Each open house banner that is for realtors is often seen at condos or new housing developments. Many assisted living areas will also display these flags for advertising to potential residents. 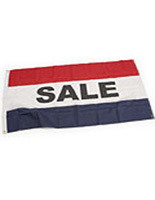 This advertising flag is an open house banner with same day shipping when in stock and ordered by 1pm EST (M-F).